August Graun, who died in 1736, was a tax-collector based in Wahrenbruck in south-west Brandenburg. His three sons, August Friedrich, Johann Gottlieb and Carl Heinrich, studied music with Johann David Cocler, the town organist, and all went on to make musical careers. The eldest of the three – but the least well-known to posterity – was August Friedrich (1698/9-1765), who was Kantor of the Cathedral School at Merseburg from 1729 until his death. His two younger siblings made a larger mark on the musical world. Johann Gottlieb studied the violin and composition in Dresden with Pisandel and also with Tartini in Padua. He re-established himself in Dresden (where, incidentally, he taught W.F. Bach). He went on to hold important positions in the Berlin of King Frederick II. As a composer he wrote concertos for violin and other instruments, symphonies and chamber music, and his own playing was much admired. The youngest of the three brothers, Carl Heinrich made his name as both singer and composer, working in Dresden and in Prussia, like his brother. His operas - and to a lesser extent his church music - have deservedly attracted renewed attention in recent years; René Jacobs’s 1995 recording of his Cleopatra and Cesare on Harmonia Mundi HMX 2901561.63 rightly won many admirers. 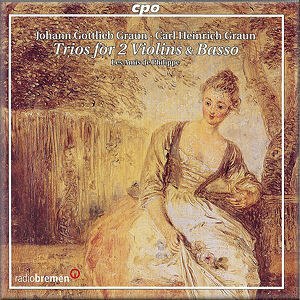 The present richly enjoyable CD contains five trios by Johann Gottlieb and Carl Heinrich. In some areas of the brothers’ work it is near enough impossible to know who wrote what with any certainty – as Grove puts it “problems of attribution, chronology and biographical detail remain”. Manuscript attributions usually refer simply to ‘Graun’. The first thing to stress is that one should not be put off by such problems – the music is delightful and inventive. This issue from CPO benefits from some scholarly notes by Ludger Rémy, who points out the complexities of the manuscript tradition where these works are concerned. These performances are based on manuscript copies (none of them in the composer(s) own hand) preserved in the State and University Library of Saxony, in Dresden. All but GraunWV Cv:XV:100 are in three movements (slow-fast-fast); the exception has four movements: adagio, allegro, affetuoso, allegro. The fast movements bubble effervescently and are never short on ideas; the slow movements are graceful and often full of feeling. There’s a good deal of variety, many changes of pace and dynamics and a few more-or-less unexpected twists and turns. This is sophisticated chamber music and, though one hears affinities with, say, Corelli and even C.P.E. Bach, the music has a distinctive character of its own. It gets fine performances from Les Amis de Philippe, full of both subtlety and discipline. The recorded sound captures the intimate interplay of the ensemble very satisfactorily. I, for one, would very much like to hear more of the Grauns’ chamber music.